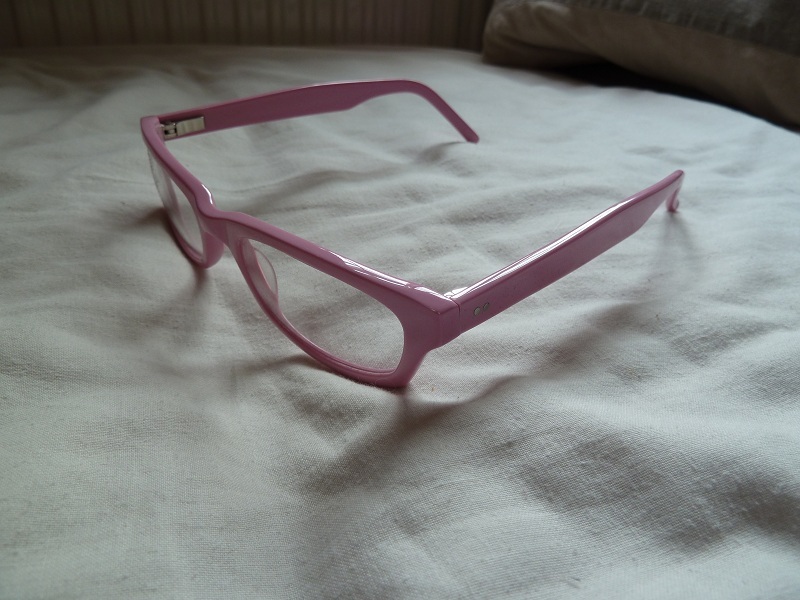 These are the latest ‘physicist’ glasses. By looking through them, I see that you are mostly space - the atoms we comprise are mostly vast empty space. Looked at a different way, the total mass of air in a modest lounge is equal to yours, by my calculation. And in another calculation, your mass is the energy of six months electricity used by America. I have realised that what makes you up was manufactured in unthinkable and spectacular processes in suns. Like a God, I may imagine your life as a line in space time with a beginning and an end. Or I may imagine it seen through the gaze of your consciousness, a series of fleeting moments, each with a cause and effect. Casting my mind’s eye out I can see us both as an infinite emission of images travelling into space at the speed of light. I know that light is electricity and magnetism. I know that energy is mass. And I know that you and I, the moon and everything else are accommodated in comfortable curvy space-time. I may think of us as a hierarchy: of quarks, electrons, atoms, molecules, charge, pressure, electricity, chemical reaction, heat, heart, brain, eyes, questions, wonder and hope. We are machines for conjuring food and light into life, and information into reason and imagination. And some joke that I am a machine for making coffee into theorems. At lunch, I do an experiment to investigate the Bernoulli Effect: I blow under the bill to send air up and over your place-mat. Everything ends up all over the floor. In the kitchen I write a formula on a carrot in biro and twist the carrot until it shears in two. I want to show you the perfect spiral break that relates to the mathematics of a black hole. And in the laboratory, my mind’s eye is visualising how things are for the atom or the electron as I write the equations and then flips consciousness and concerns itself with measuring devices and equipment and wires. I am always at either extreme. I work carefully for years in the basement, amongst the air conditioning ducts, looking at something tiny that may, if I am fortunate have consequences for our wider understanding of nature and existence. Each step, each piece of equipment is a creation. And we see patterns in this microscopic world and know we have seen them before in ours and in worlds beyond ours and I never stop wondering about this. A successful experiment will surprise us and destroy previous models or theories. Anything else would be boring. When working on theories, I lie down and the glasses clear a space in my head where mathematics and physics are crystal clear, full of colour and form. When I look at you, what I’m seeing is light reflected or emitted from your surface. If my eyes were more general, I could see other things, I could see heat and the silent cacophony swarming through the room that is temperature, television, radio, internet, phone calls, big bang and cosmic rays. Sometimes I see light as straight lines and geometry. Other times I think of it as rain or waves or wavy rain and summed over all possible paths. And I apply the same ideas to matter. I see nature in different ways to suit my purpose – though the answers must always equal our measurements in the real world. I recognise that you are someone who sees the world differently to me........we may not be able to agree on simultaneity, though we can both be right. The dogmatic world can learn from our experiences - we take care to understand each other’s situation. And I travel back in time by looking at light from the early universe and extrapolate further back from this image using our physical laws, though I suspect we may never come to know the gestation that bought about the birth. For the present, I envisage the world as colourful vibrating fields. With a sense of musicality I see everything as a disturbance in a dancing field and the world as a sound board. In a development of this model, some of my colleagues are prototyping a way of thinking that considers everything as strings. I sometimes reflect that it would be interesting to imagine how people will see the world one hundred years from now. Their visions might be quite different, though the answers must always be the same. I discover that we are information in a world of information that we struggle to locate. That we are limited by our senses, but made freer by intellect and imagination; That we are important and insignificant; powerful and restricted by our place in the experiment; and that there is comfort in not knowing and excitement in finding out. Sometimes, the immensity of our ideas means that I am unable to climb ladders and look up. When I go home at night, though I may keep the glasses on, I sometimes play the violin; draw my girlfriend, swim off Brighton beach in the first days of summer. I sit tensely in hospital while my son has an appendix operation, I listen to Wagner and wonder what it is I like about him. I go to rock concerts, practice ballet (though I gave it up seriously to do physics), I ride my bike, play Bach on the piano, paint, look at art, I build an aircraft simulator to travel without leaving home.....and robots, and collect rare books about touring in Britain before the car covered our streets with its shiny carapace. I help organise the gay pride march, photograph butterflies, fry the perfect chip, tell my daughter that mathematics is her friend, read Nabokov or science fiction books. I make intricate pencil drawings of my dreams, put on sparkling plimsolls with cerulean blue laces, die my hair pink, feed the rabbits. I bake apple pies and do other things that are ways of experiencing and saying something about the world in all its richness.